The world paused for a few short days in August 2004 to honor Olympic athletes from all across the globe. They came from countries large and small, wealthy and poor, far and near: each one determined to be the best in the world in his or her chosen field of competition. We were inspired by the amazing strength of swimmer Michael Phelps, the unswerving determination of gymnast Paul Hamm, and remarkable performances of thousands of others. Yet, the power of Michael Phelps is not that he had the strength to continue from race to race winning back to back gold medals. The amazing thing is that he had the courage to continue to train and race after the many times he lost the race or when he was exhausted or injured during his early years of training. He persisted in his goal to become an Olympic Athlete; the medals were simply a result of his preparation and perseverance. Likewise, the inspirational story of Paul Hamm is not that he fell in his third event and then got up and went on to win gold. The true greatness of Paul Hamm is that he got up and kept working after all those thousands upon thousands of times he fell during nearly a decade of training. His Olympic comeback was not unusual for Paul Hamm; it was part of his makeup, his commitment to excellence. The Olympics is not just about a group of people coming together to make a single “Herculean” effort for three weeks in Athens. The magic of the Olympics is that it showcases thousands of athletes who have spent untold years of consistent, dedicated effort: athletes who refused to give up when the road was difficult, who believed in themselves when no one else would, who committed their whole heart to the dream of Olympic glory. Too many of us quit at the first sign of resistance. The message of the Olympics is that we cannot afford to give up so easily. With regard to our own goals and desires, how can we say they cannot be achieved until our muscles are sore, our knuckles bloody, our creative intellect exhausted, and our determination to win has carried us through disappointment and defeat and on to victory? 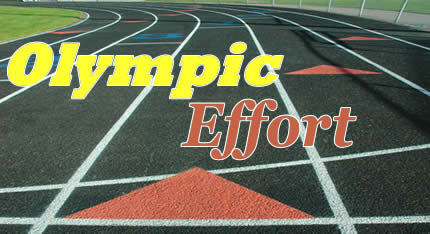 The winners in life realize that success is a result of Olympic-sized effort. Anything less is not enough. Persist, believe, work, commit, and you too will achieve your goals. That is the promise of the Olympics. Bill Mansell is president of MindPerk, Inc., one of the web's largest resources for self improvement and business training. A dynamic speaker and success coach, Bill is the author of a weekly blog titled, One Minute Motivators. Bill helps companies and organizations inspire and motivate their team members to consistently achieve more. His contagious enthusiasm has helped people from all walks of life to reach and exceed their goals. Bill Mansell has 149 articles on MindPerk.